A day off from dialysis, which is always welcome, and time spent with the family. Karl loves to keep busy, so we worked on a couple of minor projects on the trailer, knocking off a few items on my “to do” list, for which I’m very grateful! Hubby and I ended up going to bed by around 10:00, too tired to stay up for the ball drop. I think that’s the first time ever we didn’t stay up to see it, but we were just too tired this time, and frankly, most of the time the network coverage is so tediously boring, and the music so incomprehensible, we didn’t figure we were missing much. Yawn! 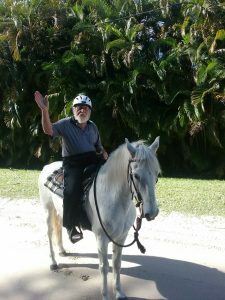 After a good night sleep, I hooked up with my other brother Karl as I was out feeding the horses. We sat by the pool for a bit while I played fetch with Lola, getting caught up on both our activities since we last spoke some time ago. 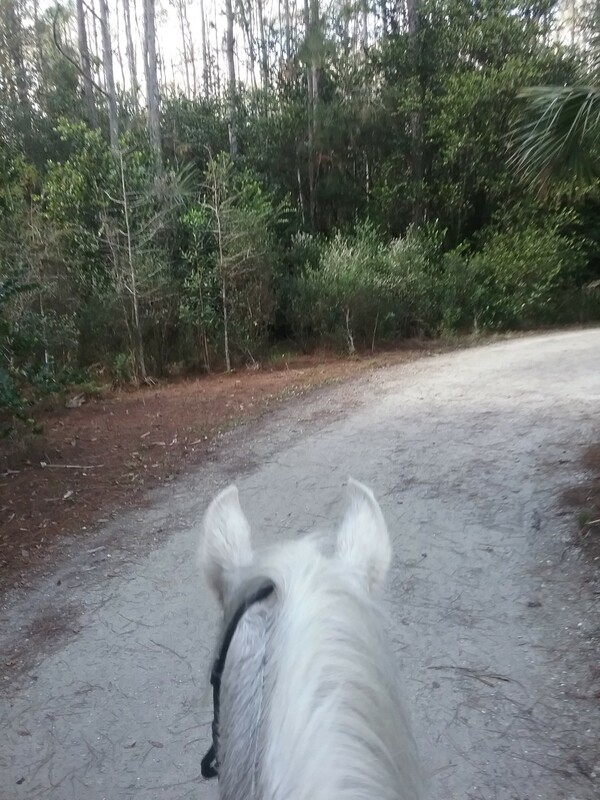 Before long, Hubby was up and about, and we had already decided to go for a ride this morning if he was feeling up to it, and he was, so I saddled up both horses and went off for a short 3 mile ride around the neighborhood. We figured out that it's better if he's in the lead on Flash, with me following on my fat and slow Apollo. That was, Flash's walk forces Apollo to at least jog to keep up, so he's getting some much needed exercise. 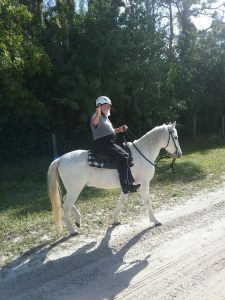 Once we got home, Jeff hopped on to Flash, although he though he was going to be riding Apollo after all my comments about how much Flash likes to run, but he did just fine. Flash is so responsive and gentle I'm not sure it matters who is on him, so long as they're gentle on his quite sensitive mouth. We headed out for another short hour-long ride, and everybody was happy to get a ride in, and even Flash didn't seem to mind the short rides after his long ride yesterday. Because of the holiday, it was time to take Hubby to his in-center dialysis. We started going to the local Fresenius in Stuart, FL, both as an experiment, and to give me a break. We wanted to see if a 3-day schedule would be easier for his system to take than 5 days at home, plus I'm hoping that the extra days off will both give him more time to recover, and me more free time to get all the things done that are on my list (not to mention training Flash up for possible endurance rides). He just started last Wednesday, and so far, so good, though it's kind of hard to tell after just two sessions, and particularly with the holiday schedule, which changes the days around a little bit. Time will tell! While my plan was to ride Flash today, I had no real route planned out, just that I wanted to take a different route to keep him (and me) from getting bored, so I headed up 134th Way N., crossing Indiantown Road and following the canal back along the WMA area. There's a new crossover into the neighborhood at the first turn, but I decided to wait to explore that on another day. 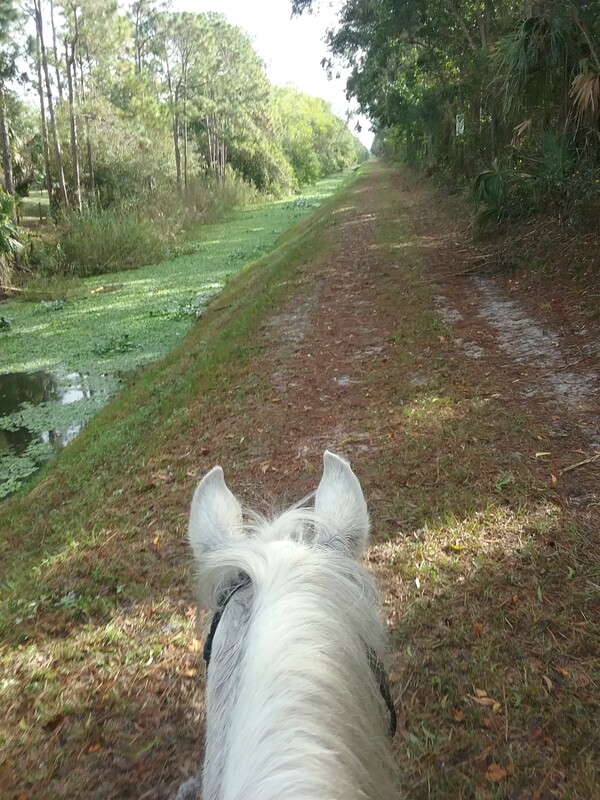 I continued following the canal until I was going along the north end of Loxahatchee Slough. 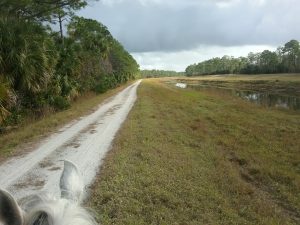 I had planned to do about 12-14 miles today, and when I saw a sign saying the actual Slough was only another 2.5 miles, after I'd only done about 4 miles, I decided to at least reach there. Then when I got there, I decided to go into the trails there, just for variety. Then I decided I didn't want to come back the way I came, so I headed east, then north along the main canal until I reached Riverbend Park! By now, I had gone more than the 14 miles I had planned, and still had another 5-6 miles home. 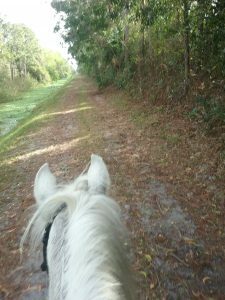 I followed the shortest trail to the underpass under Indiantown Rd., and followed the trail back to Cypress Trails, and eventually home. All told, we went over 21 miles! Longest ride on Flash so far! He took it all in stride, keeping up his pace even when I didn't ask him to, and I even had to hold him back so as not to overexert himself. One time, he evidently decided he wanted to take a roll, and started to lay down on a slope. I jumped off, and then I think he realized he couldn't roll uphill, so he just sat there for about 20 seconds, then got right back up on his feet, apparently ready to keep going. I let him walk behind me for a while to give him a breather, and he walked very patiently and calmly behind me, which was great, as he usually tries to run past me. Eventually, though, I climbed back aboard and we carried on. 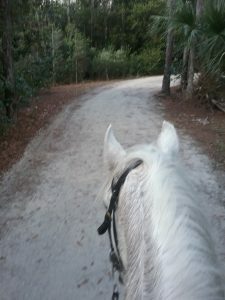 By the time we reached the tunnel, he was too tired to react much, fortunately, and the rest of the ride was uneventful. 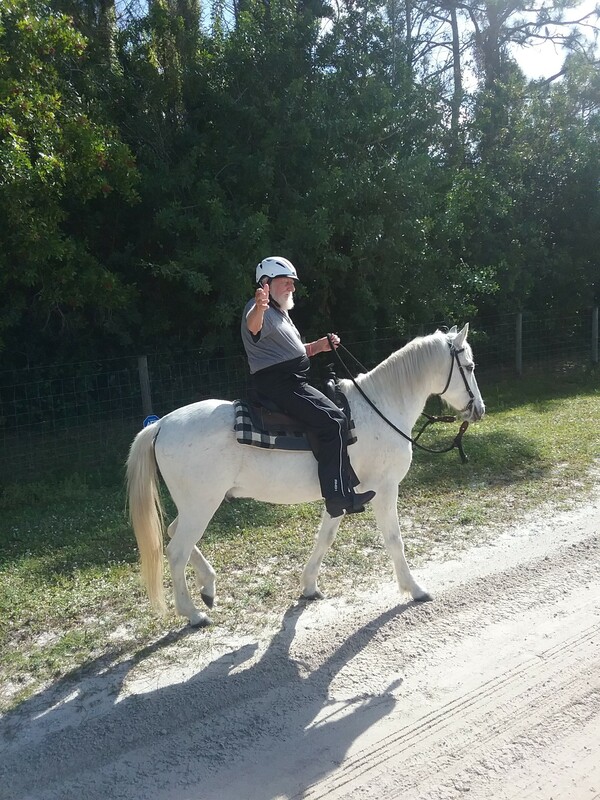 What a fabulous horse! No complaints, no resistance! 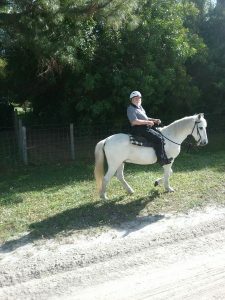 I even had trouble getting him to stand still when I tried to rest him, he insisted on keeping going. This horse loves to move! We finally made it home after five plus hours. He was ready for a nice rinse-off, and I gave him some extra hay for all his work. Frankly, I'm surprised I'm not more sore than I am, as I'm trying to condition myself for endurance as well. What a great day! Dialyzed Hubby in the morning so that we could spend the rest of the day lounging by the pool, which we thought was the plan for my brother and his company, but they all ended up sitting by my brother’s homemade smoker next to the garage so they could keep an eye on things. Brother stuffed it full of a big turkey, a couple of chickens, several racks of ribs and some fish for Hubby as well. I made up some stuffing, mashed some potatoes and helped set up the buffet, which we soon pigged out on. Frost also came home in the afternoon, with quite a positive prognosis. Evidently, if he had to have his teeth knocked in, his was the perfect way to do it. They managed to wire it all up with no problem, but his recovery is going to take 2 or 3 months, no grazing, just grain and loose hay. Jeff’s got a little grass-free run-out space outside Frost’s stall, so at least he’ll be able to stretch his legs a bit. Sorry it happened, but fortunately, his boarder doesn’t seem to be holding it against us, probably because Frost has a history of not getting along with other horses, which they neglected to mention, I guess. Anyway, he’s back, and in Jeff’s care again, so it will be fine for now. Had a relaxing evening, with Hubby and I retiring to the trailer and watching “It’s a Wonderful Life” on Amazon Prime, the first time we’ve used that service, and the first time I’ve seen it without commercials in a VERY long time, so it was utterly enjoyable. A great way to top off our Christmas! Quiet morning, then dialyzed Hubby in the afternoon while I baked sugar cookies and pumpkin pie for tomorrow. 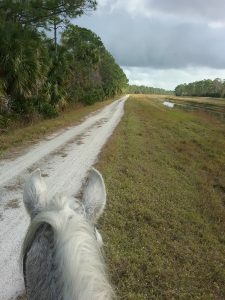 After a few days rest and the completion of a few more repairs and chores, Flash and I took another ride along Cypress Creek, this time passing the parking lot and going about a mile or so farther, for a round trip of just over 10 miles. When I looked at the GPS map on Google Earth, I realized that I had just about reached the western edge of Riverbend Park to the south on the other side of the road, where we used to trailer to, in order to do their 6+ miles loop trail inside. I looked more carefully at the trail, as I had heard they had added a way to go over the Indiantown Rd. Bridge without going on the road, and sure enough, I found it. From there, we can get to the tunnel under the road which will take us right into the park. It will add quite a few miles to the trip, but then again, we’re supposed to be conditioning for future endurance events, right? That will be a much longer ride, but hopefully, we’ll be able to find the time! 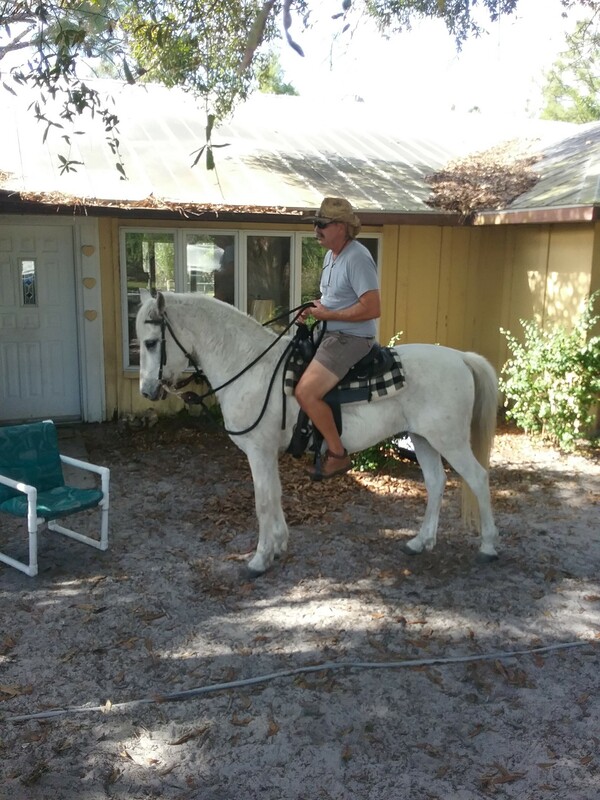 After we got back, Jeff and I decided to finally mix the horses together, that is, our Apollo and Flash with his boarder’s horse Frost. Up to now, they’ve only been looking at each other over the fence, and at first Frost was kind of mean, running up to the fence with his teeth bared anytime one of the other horses came to visit. I saw Flash trying hard to get along with him, but he was always met with some resistance at first. After almost three weeks, though, they seemed to have settled down, and having worn out Flash on a long ride, we figured everyone would be okay, so we let Frost out. They stayed away from each other, but they were certainly aware of each other, so we watched them for about 20 minutes, and nothing happened. They all grazed in their respective corners, so Jeff went off to Publix and I went in to start Hubby’s dialysis. A while later, I went out to check on them, and I noticed that Frost’s mouth was all covered in red, so I thought he had gotten into some of the red berries around Jeff’s place, some of which I know aren’t good for horses, so I told him about it when he got back, but determined the berries he probably got into weren’t toxic. Half an hour later, Jeff came back to me to tell me that the red wasn’t from berries, it was blood, that Frost was bleeding from broken teeth! I went to look, and sure enough, several of his teeth were hanging like they were on a hinge, dropping down to his tongue! OMG! He was incredibly subdued about it, which is why I didn’t catch it, probably from shock I guess. Obviously, he had been kicked in the teeth, so I decided I’d better go check my horses for any damage. Since Apollo had bullied Flash around for six months after we got them together, I figured it was Apollo, but he was unscathed. Then I checked out Flash and sure enough, found a great big wound caused by teeth marks, so obviously he got bit by Frost and he reacted as only a horse can, by kicking him, getting in a lucky shot (or unlucky, as the case may be) that broke Frost’s teeth or jaw, we weren’t sure what. The owner came and picked him up to take him to the animal hospital, understandably unhappy, but what can you do? 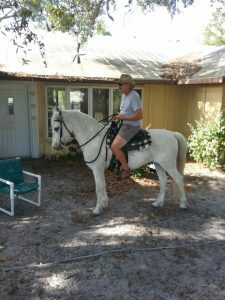 Horses will behave like horses, there’s not much you can do, except keep them permanently apart, which we didn’t really want to do. We were hoping they’d all get along so we could all ride together, but of course, if they don’t get along on the ground, they’re not about to get along in the saddle, at least not with ME in the saddle, thank you very much. Sorry it happened, a hard lesson learned, but it seems that Frost has had trouble before, so I discovered from some relatives that got there before the owner, which would have been good to know before… Anyway, they drove Frost away, and we settled down for the rest of the evening. FINALLY had a good night sleep! It feels like ages since that’s happened! I guess it was because I was back in my own bed, we were back out in the quiet of the country instead of ear-plug imposed silence, and it was cool enough to open the windows for some fresh air! Just too darned tired to much of anything today! Well, a better night sleep, but it still took me a long time to get to sleep, despite my tiredness. We slept a bit later, then went down to Hampton’s fabulous breakfast (as always) and we hit the road content. The rest of the trip was uneventful and we even got back early enough to stop at brother Jeff’s and unload the rental car. Hubby decided to stay at home while I ran down and turned the car in. It was an exhausting trip, and we hadn’t planned on dialyzing today, but he started to feel poorly, so we decided we had to, even though we were both tired. Fortunately, it was fairly uneventful, and we were really ready for bed by the time we got done, which was the latest ever! Had a lousy night sleep at the Red Roof, could barely breathe from the mustiness in the room, and their breakfast was pathetic: a couple of muffin choices, dried bread, and the waffle maker batter was practically empty, so we left without having much. Good thing we packed some fruit! We munched on that on our way to the clinic, arrived early, finished in about 90 minutes, then hit the road south again. We had a couple of quick stops to make, but managed to get to Valdosta by about 8:00, where we stayed at the slightly more expensive but infinitely better quality Hampton Inn. We ordered Chinese delivery, I had a nice hot bath, enjoyed our dinner when it arrived, and, exhausted, went to be as early as possible. After a week of getting settled in, doing some odd repairs here and there on the trailer and the car and the truck, we finally had to honor our agreement to return to Nashville for Hubby’s monthly dialysis clinic at Vanderbilt. We rented a car because I didn’t want to put a lot more mileage on the truck, and because we wanted something that got good gas mileage and would be reliable, and picked up our Chevy Malibu near the airport last night. We got up before the sun did, and were on the road an hour before sunrise. We managed to make it to the house in Tennessee about an hour before dark, picked up some things we had forgotten (I had made a list every since we left), and headed down to Manchester to stay in a hotel. We didn’t want to go through the trouble of putting the water back on, or the heater or uncover the furniture and all that nonsense, so we had made a reservation at the Red Roof, because we had Lola with us and they took dogs. NEVER AGAIN! The room was musty, there were bugs in the bathroom, lots of other problems, enough said! Grabbed some dinner at the Waffle House across the street and went to bed early.